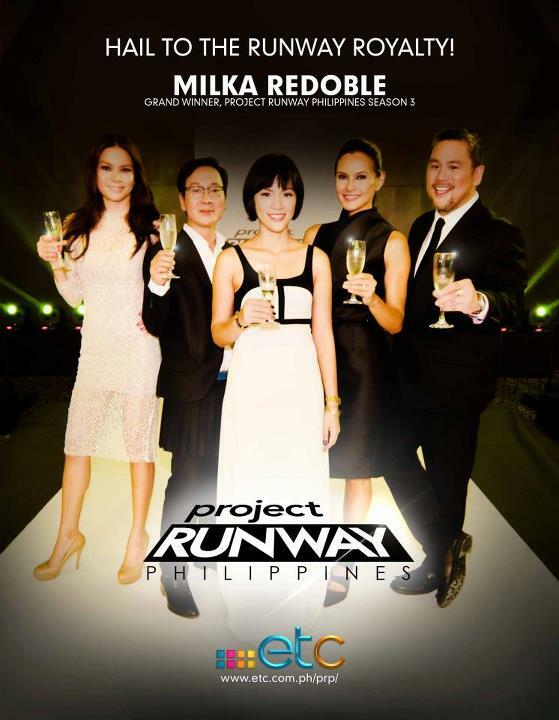 Milka Quin Redoble (Pasig) is the runaway winner of Project Runway Philippines Season 3. She is triumphant over 4 other grand finalists – Cheetah Rivera (Manila), Nel Claveria Jr. (Camarines Sur), and Amor Albano (Laoag City). Her local Philippine banana plant inspired collection wins over the other finalists. Prior to the selection of the grand finalists, Glenn Gonzales (26, Pangasinan) was part of the top 5. There were supposedly only 3 grand finalists but the show made an exemption this year and chose 4 designers to create a 12-piece collection for the final runway. Hailing from the same province and town and attending the same high school (he was a schoolmate, my younger brother’s batch, and one of my classmate’s younger brother), I was rooting for him and was disappointed that he was the only one eliminated while the other 4 became grand finalists. Talking about the 4 grand finalists collection, I’m no clothing enthusiast but I’d agree with most everyone’s thoughts about Cheetah’s collection. It was very couture, high fashion, and explosive. Cheetah even remained standing with Milka as the last 2 finalists left standing during the announcement. The judges, however, thought that designers cannot merely drop bombs every time as what will be left is only ashes and debris. Her theatrical and stylish style was not favored during the deliberation although it was highly considered. These thoughts were particularly coming from the guest judge, Lesley Mobo, a London based Pinoy international designer. The resident judges include Rajo Laurel and Apples Aberin. Jojie Lloren is the show’s mentor and Tweetie De Leon-Gonzales is this season’s host. Other guest judges include Lesley Mobo, Lucy Torres-Gomez, Jacq Yuengtian, Leeroy New, Margarita Fores, Sari Yap, Rhett Eala, Ruffa Gutierrez, Randy Ortiz, Rocio Olbes, Camille Co, and Inno Sotto. These are popular personalities in the world of fashion, business, and entertainment. Names are listed in order of appearance to the show with the last name as the first to appear. Going back to the grand finalists’ collection, Amor’s was the least favorite. Amor was the first to be asked to leave the runway. The final runway collection she created were somewhat lacking but they’re great party dresses nonetheless. She also had a good theme and the clothes reflected them. Nel on the other hand was consistent with the theme of a bubble. The clothes he designed were indeed bubbly and lively. The order by which the clothes are presented was also well organized. But it still lacked what’s needed to win the contest. As for the winner, Milka, I’m not really a fan of her collection. I was thinking Cheetah’s execution of her savannah theme is more believable. Every piece of her collection is more aesthetically appealing as well although some of them are pretty scary to look at. But like I’ve mentioned, I have no fashion authority to name a winner. J But on a marketing value, Nel’s and Amor’s (the first to be eliminated during the grand finale) collection will definitely be purchased more among these four designers. Milka is the first female winner of the show. Her advantage can be her experience and maturity in the business. I’ve seen her portfolio online. She was already designing and selling her clothes through Etsy as Milka Quin before marrying and carrying the Redoble surname. She is 34 and is more mature as compared to the other grand finalists. Nel is 30, Amor is 28, and Cheetah is the youngest at 24. If you’ve watched the show from start to finish, the grand finalists are already excelling during separate episodes and had won a challenge in one of such episodes. Milka won 3 challenges (episodes 1, 3, and 8) although Cheetah won 3 challenges too (episode 9, 10, and 11). Amor won the challenges for episodes 6 and 7 while Nel won episode 2’s challenge. MJ Alminanza (24, Zambales), Jenno Gacasan (24, Cebu), Ionica Abrahan (21, Batangas), Lhenvil Paneda (21, La Union), Joseph Montelibano (35, Iloilo but living in New York City), Enzo Libo-on (23, Bacolod City), Yves Camingue (25, Cebu City), Karla Galang (27, Quezon City), Fatima Guerrero (21, Nueva Ecija), and Normannie Santos (28, Bulacan). These individuals have already made a name for themselves by landing on the show as one of the contenders among thousands of hopefuls who wanted to join. Names are listed in order of appearance on the show with the last name as the first to be eliminated.